This is something I have wanted to do for YEARS!!! I have even conducted meetings with other women in ministry to plan and strategize for this. But it just never seemed to be the right time… until NOW!! A few months ago I was so thrilled to see one of my fav ministries for pastor’s wives and women in ministry Leading & Loving It come up with the fabulous idea to initiate local chapters. To which I quickly signed up to lead the Gainesville, FL area. It has taken a few more months of God’s timing for it to come to fruition but I am so pleased to announce that Leading & Loving It North Central FL is finally here!! So, what exactly is L&LINCF? I am so glad you asked!! It is a community that connects, encourages, and supports pastors’ wives and women on staff in ministry in the North Central Florida area. If you have served in ministry any length of time you know it is one of life's greatest joys but at times it can become very difficult to navigate life, marriage, children, home, AND ministry. L&LINCF is here to rejoice with you in your victories and be a source of strength in your difficulties. 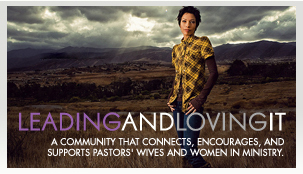 So if you are a pastor's wife (lead, youth, worship, children, etc.) or you yourself are in ministry, join in ladies and let's do life together!! We have a Facebook group page you can join by clicking here. Also, we will be hosting our first bi-monthly meeting on Friday, October 21st in Alachua, FL entitled Christmas in October. I know, it’s not Christmas yet, and I promise we are not trying to rush it, but from Thanksgiving until New Years Day leaders in the church are serving more, sharing more, giving more, and attending more parties than we do all year long. And we can get stressed, Stressed, STRESSED. So this will be a night of fun, surprises, gifts, an elegant dinner, followed by a time of focusing our hearts and minds on Jesus... our savior, our rock, our strong tower, and our peace... as we embark on this most wonderful, and sometimes crazy, time of the year. If you would like to register for our October meeting and/or you would like more info on L&LINCF click here and more information will be sent to you. Again, this is open to any lady whose husband is in ministry or she herself is in on staff in ministry in the North Central Florida area.